Transcatheter Aortic Valve Replacement, or TAVR, is a minimally invasive procedure to repair a damaged valve by inserting a replacement without removing the old, damaged one. The procedure, sometimes called TAVI (Transcatheter Aortic Valve Implantation), is an alternative for patients who might not be candidates for open-heart surgery. And, because it’s less invasive than traditional surgery, patients recover more quickly (and, on average, they go home after three days in the hospital). After the Food and Drug Administration approved the artificial valve used in TAVR in 2011, doctors at the Heart & Vascular Institute at Hartford Hospital were the first in the state to perform the procedure. Since then, they have performed more than 1,000 TAVR procedures, making the Heart & Vascular Institute the largest program in the state and one of the largest in New England. Our physicians have performed TAVR procedures using a range of approaches -- transfemoral, subclavian, transapical, direct aortic and transcarotid -- selecting the best design for each patient’s needs. The hospital’s clinical work has been complemented by research, says Dr. Raymond G. McKay, co-director of the Structural Heart Program. “Hartford HealthCare physicians have served as the principal investigators in multiple multicenter national trials documenting the safety and efficacy of TAVR and leading to FDA approval for TAVR use in extreme-risk, high-risk and intermediate-risk patients." In fact, doctors at Heart & Vascular at Hartford Hospital have performed more than 100 TAVR procedures on intermediate-risk patients, with no serious complications. The next step: TAVR for low-risk patients. Hartford Hospital has been accepted as an investigative site for the PARTNER 3 Low Risk Continued Access Registry, beginning in summer 2018. Only 35 hospitals nationwide were chosen, with Hartford Hospital the only one in New England to join the registry that allows TAVR procedures in low-risk patients without randomization to surgery. The Heart & Vascular Institute at Hartford Hospital has been selected as one of 35 hospitals nationwide participating in a study that allows low-risk patients with severe aortic stenosis to receive a replacement aortic valve in a minimally invasive procedure using catheters instead of conventional open-heart surgery. Since the Food and Drug Administration approved transcatheter aortic valve replacement, or TAVR, for high-risk patients in 2011, Hartford Hospital has performed more than 800 successful procedures -- the foundation of one of the biggest TAVR programs in New England. It's the only New England hospital accepted for this study, the Partner 3 Low Risk Continued Access Registry, by Edwards Lifesciences of Irvine, Calif., maker of the Sapien 3 biological-tissue heart valve used in the TAVR procedure. Hartford Hospital physicians have served as principle investigators in several national trials documenting the safety and efficacy of TAVR, leading to the FDA's approval for the procedure in extreme-risk, high-risk and intermediate-risk patients. Already, Hartford Hospital has performed more than 100 successful TAVR procedures in intermediate-risk patients, with no fatalities or serious complications. Because of the newness of TAVR technology, it's expected doctors will follow a patient's health for at least 10 years to help determine the long-term durability of the Sapien 3 valve. Aortic stenosis, often related to age, can be caused by mineral deposits (calcium) on the aortic valve's leaflets. Eventually, the leaflets stiffen and lose their capacity to open completely, making it more difficult for the heart to pump blood through the aortic valve to feed the rest of the body. Because blood now reaching the brain contains less oxygen, it can cause symptoms like shortness of breath, lightheadedness, fatigue and chest pain. Smoking, high cholesterol and high blood pressure can also contribute to aortic stenosis. Conventional open-heart surgery to replace the aortic valve usually requires an incision across the sternum (breast bone), a heart lung machine that takes over for the patient's heart during the procedure and the removal of the diseased aortic valve. In a TAVR procedure, an interventional cardiologist works with a cardiothoracic surgeon, guiding a new valve through an incision in the leg as the patient's heart beats. The new valve is placed within the diseased aortic valve. On Jan. 14, 2019, the Heart & Vascular Institute's structural heart team at Hartford Hospital completed its 1,000th TAVR procedure. The TAVR procedure was originally developed to help patients with significant risk of complications by inserting a stent that pushes the old valve out of the way and puts a new valve in its place. Since that time, Hartford Hospital physicians have served as principle investigators in several national trials documenting the safety and efficacy of TAVR, leading to the FDA’s approval for the procedure in extreme-risk, high-risk and intermediate-risk patients. Dr. Robert Hagberg, chief of cardiac surgery at Hartford Hospital, said the popularity of TAVR is growing because patients often tolerate it better than open-heart surgery and face a faster recovery. “It’s actually competing with standard surgical aortic valve replacement now because TAVR is becoming mainstream,” Hagberg said. 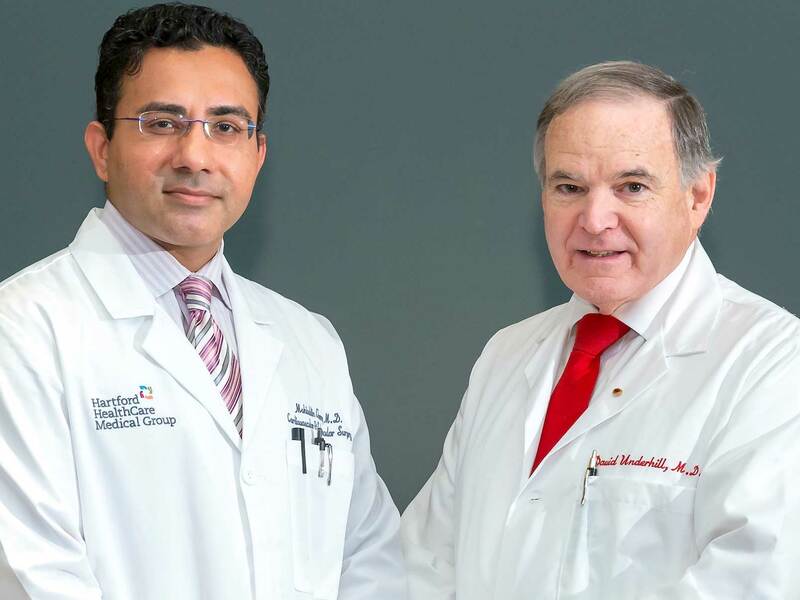 Dr. Mohiuddin Cheema and Dr. David Underhill of the Heart & Vasculara Institute are pioneers. In September 2016, Dr. Cheema performed the first TAVR procedure in New England that implanted a new cardiac valve through the carotid artery in a patient’s neck. In the most common TAVR technique at the Heart & Vascular Institute at Hartford Hospital, a new cardiac valve is implanted in a patient’s heart through an artery in the groin or subclavian (collar bone artery) or ribs (removal). Unfortunately, this approach cannot be used in all TAVR patients if their groin arteries are diseased or are simply too small. For many of these patients, the only option involved implanting the TAVR valve using alternative techniques that required surgically entering the patient’s chest. Transcarotid TAVR can only be performed by doctors who have been trained in both cardiac and vascular surgery. “Our successes with TAVR and carotid vascular surgery afford us the ability to draw on both experiences to offer patients a less invasive solution,” says Dr. Underhill, the first cardiothoracic surgeon, in early 2012, to perform a conventional TAVR procedure at Hartford Hospital. “It pushes the envelope," says Dr. Robert Hagberg, Chief of Cardiothoracic Surgery, who assisted in the Heart & Vascular Institute’s first transcarotid TAVR with Drs. Cheema and Underhill. "It pushes us to explore things we might not have thought about before. It's medicine that takes care of patients in a better way." The carotid approach has been so successful that Dr. Cheema, who has dual board certifications in cardiac and vascular surgery, has been teaching the procedure to other physicians throughout the Northeast. “We plan to begin a formal teaching program at Hartford Hospital to bring physicians to our center to learn this procedure,” he says. A friendly face … a skilled helping hand. With Hartford HealthCare’s nurse navigators, TAVR patients and their families are never alone. Starting with the first meeting between doctor and patient, nurse navigators serve as advocate, educator and source of encouragement. They help develop an individualized care plan for each patient, explaining it in easy-to-understand terms. They coordinate appointments and tests, and follow up on treatment decisions. They’ll even arrange translation services, if needed. A nurse navigator helps coordinate the work of doctors, nurses, advanced practitioners and staff members who work with TAVR patients. Our nurse navigator, Courtney Hurlbert, works with the Structural Heart Advanced Practitioners -- nurse practitioners Lauren Curtis and Kerry McGuire and physician’s assistant Nicole Hoover – to help educate and care for every patient. At the Hartford HealthCare’s Heart & Vascular Institute, we put the patient (and family) first. 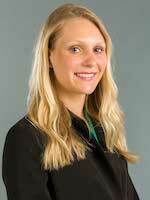 Courtney has an extensive background in patient education and cardiology. She takes what seems overwhelming and makes it manageable for you. I am a master’s prepared nurse with experience in cardiology and certified as a Clinical Nurse Leader (CNL). I will be there every step of the way as your educator, source of encouragement, resource and advocate from pre-procedure to inpatient and even after discharge from the hospital. I’m here to help you and your family across each transition. After your first meeting with one of our program coordinators and your physician, I will work closely with them on your behalf to make sure you have the best understanding of your individualized care plan. Together, we’ll make sure our plan addresses your goals for recovery. Nurse practitioners Lauren Curtis and Kerry McGuire, physician’s assistant Nicole Hoover and I will become your go-to communicators by coordinating appointments and tests and following up on treatment decisions. I look forward to meeting you with the rest of our TAVR team members. A: TAVR, or Transcatheter Aortic Valve Replacement, is performed on patients with aortic stenosis, initially only those classified as high risk or inoperable. All patients are carefully evaluated by a Heart Team comprised of interventional cardiologists, cardiothoracic surgeons, imaging specialists, advanced practitioners, and nurses to see if they are candidates for traditional surgical aortic valve replacement or if TAVR would be the best treatment option. Q: When did Hartford HealthCare begin offering TAVR? A: January 2012 at Hartford Hospital. Q: When was TAVR approved by the Food and Drug Administration? A: The FDA approved the SAPIEN Transcatheter Heart Valve in November 2011 for the treatment of patients with severe aortic valve stenosis who have been determined by a cardiac surgeon to be inoperable for open aortic valve replacement. In August 2016, the FDA expanded the use of TAVR for patients at intermediate risk for surgery. Q: Who performs a TAVR procedure? A: TAVR is a collaboration between an interventional cardiologist and a cardiothoracic surgeon. A: Aortic stenosis, often related to age, can be caused by mineral deposits (calcium) on the aortic valve's leaflets. Eventually, the leaflets stiffen and lose their capacity to open completely, making it more difficult for the heart to pump blood through the aortic valve to feed the rest of the body. Because blood now has less oxygen, it can cause symptoms like shortness of breath, lightheadedness, fatigue and chest pain. An estimated 2.5 million people over age 75, or more than 12 percent of that demographic in the United States, have aortic stenosis. And 80 percent of adults with the disease are male. An estimated 50 percent of people with severe aortic stenosis will die, on average, within two years if they do not have their aortic valve replaced. Q: How is aortic stenosis diagnosed? A: Your doctor can use several tests, starting with an evaluation of your heart through a stethoscope. An echocardiogram, which uses ultrasound waves to produce video images, provides more definitive evidence. Only a hospital with a TAVR program, such as Hartford Hospital, can evaluate you for both TAVR and open heart surgery. Before a TAVR procedure, your doctor also might use cardiac catheterization to check your heart arteries (coronary, abdominal and pelvic) for blockages. A CT scan also can determine if your arteries can accommodate a new valve delivered via a catheter. We also evaluate your lung function and assess narrowing or plaque buildup in your carotid arteries. Q: What is the difference between TAVR and open heart surgery? A: Conventional open heart surgery to replace the aortic valve usually requires an incision across the sternum (breast bone), a heart-lung machine that takes over for the patient's heart during the procedure and the removal of the diseased aortic valve. This procedure is done under general anesthesia. In a TAVR procedure, an interventional cardiologist works with a cardiothoracic surgeon, guiding a new collapsible valve through an incision (usually in the leg) as the patient's heart beats. The new valve is placed within the diseased aortic valve. When it is expanded, it pushes the old valve leaflets out of the way and assumes responsibility for regulating blood flow. More than 90 percent of patients treated at the Heart & Vascular Institute since October 2015 received their new heart valve through Conscious Sedation or MAC (Monitored Anesthesia Care). They did not require general anesthesia for their procedure. This helps facilitate a faster recovery. Q: How long does a TAVR procedure take? A: The time required will depend on your health and the approach used by your doctors: transfemoral, subclavian or transcarotid. The procedure usually lasts 1.5 hours. The average open heart surgery lasts about four hours. Q: How long is recovery from TAVR? A: TAVR patients spend about three days in the hospital. Recovery from a TAVR procedure is typically about a week, compared with three months for a surgical-valve replacement. Q: How long will the new heart valve last? A: Because of the many variables in assessing a valve’s lifespan, your Heart Team will usually instruct you to follow up with your clinical cardiologist regularly to assure the valve is functioning properly. We use echocardiograms to monitor the valve.